Labmaster is a Finnish bio company that produces and sells immunoassay kits and diagnostic reagents. The Finnish company focusing on delivering innovative diagnostics tools for applications in routine clinical diagnostics and research. 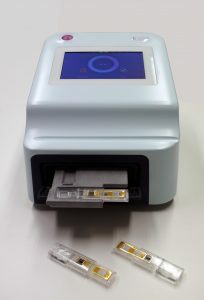 Labmaster develops and commercializes the next generation of versatile miniaturized detection tools based on its proprietary cathodic electrochemiluminescence-technology (LM-CECL). The superiority of LM-CECL technology allows it to overcome the performance limitations of previous generations’ tests relating to sensitivity, accuracy, easy to use and cost efficiency. The goal of the Eurostars project is to productize and commercialize the Labmaster’s innovative technology. The project schedule is 2017 – 2019.